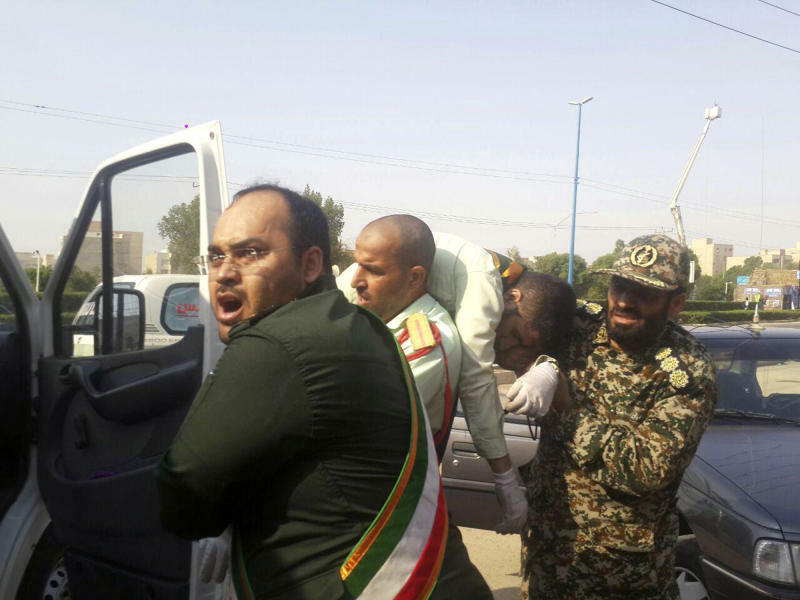 TEHRAN, Iran (AP) — Gunmen disguised as soldiers attacked an annual Iranian military parade Saturday in the country's oil-rich southwest, killing at least 25 people and wounding 60 in the bloodiest assault to strike the country in recent years. The attack in Ahvaz saw gunfire sprayed into a crowd of marching Revolutionary Guardsmen, bystanders and government officials watching from a nearby riser. Suspicion immediately fell on the region's Arab separatists, who previously only attacked unguarded oil pipelines under the cover of darkness. The separatists accuse Iran's Persian-dominated government of discriminating against its ethnic Arab minority. Iran has blamed its Mideast archrival, the Sunni kingdom of Saudi Arabia, for funding their activity. State media in Saudi Arabia did not immediately acknowledge the attack. Yacoub Hor al-Tostari, a spokesman for the Arab Struggle Movement to Liberate Ahvaz, later told The Associated Press that members of an umbrella group of Ahvazi activists his organization leads carried out the attack. Al-Tostari said the attack undermined the Iranian government "on the day it wants to give a message to the world that it is powerful and in control." The Islamic State group also claimed responsibility in a message on its Amaaq news agency, but provided no evidence it carried out the assault and initially wrongly said the attack targeted President Hassan Rouhani, who was in Tehran. The militants have made a string of false claims in the wake of major defeats in Iraq and Syria. From Tehran, Rouhani watched a military parade that included ballistic missiles capable of reaching Israel and U.S. military bases in the Mideast. Rouhani said the U.S. withdraw from the nuclear deal was an attempt to get Iran to give up its military arsenal.